Product Description Eberbach's 5850 Variable-Speed Benchtop Reciprocal Shaker is designed expressly to occupy a minimum of bench space while maintaining the versatility of our larger units. 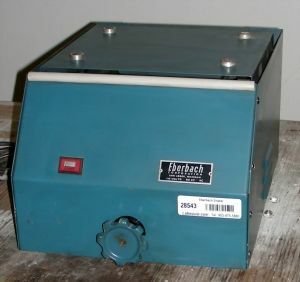 Like all Eberbach Shakers, the 5850 is simple to use and maintain. The speed is continuously variable between 20-240 osc/min. The horizontal stroke is adjustable to 1" or 1-1/2" (factory set at 1"). Model 5850 will shake a load of 10-15 lbs at maximum RPM. Numerous accessories including flask holders, utility box carriers and tiered platform systems (for doubling shaking capacity), may be available separately. What type of motion (back-&-forth, orbital, wrist action etc)?